The first loss of points in the Eredivisie of PSV does not cause Mark van Bommel to adjust his line-up. The coach said on Thursday that during the game against Excelsior he "probably" sends the same eleven players into the field. Van Bommel chooses PSV in his first season - provided there are no injuries or schringings - invariably for the same basic eleven. 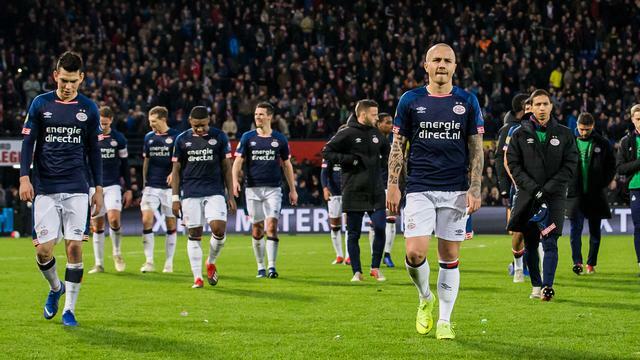 The defending champion won the first thirteen games in a row in the Dutch Premier League, but on Sunday, a 2-1 defeat against Feyenoord ended the series. "Whether I'm going to adjust my line-up against Excelsior? No, probably not", Van Bommel said on Thursday at a press conference. "It is not that after thirteen times you win and one loss you are going to turn everything around." That means that the Mexican million purchase Érick Gutiérrez will also be on the bench against the team from Kralingen on Friday. Van Bommel left sixteen-year-old talent Mohamed Ihattaren for the first time training with the A-selection. It is the intention that the technically gifted attacker will train more often in the near future. "He is developing very well from the start of this season," Van Bommel said. The trainer does not think his team needs extra incentives after the defeat in De Kuip. "You do not have to ask a reaction to your team because you have lost, as a trainer you have to ensure that your team does the same under all circumstances," said the 41-year-old coach. PSV misses Excelsior only the long-term injured Ryan Thomas, the other players have come out of the top match against Feyenoord. Despite the defeat of last Sunday, PSV is still the leader in the Eredivisie. The advantage over Ajax, which will visit PEC Zwolle on Saturday, is two more points. Excelsior occupied the twelfth place in the ranking. The team of coach Adrie Poldervaart only won one of the last five games. PSV Excelsior starts Friday at 8.45 pm and is led by referee Jeroen Manschot.